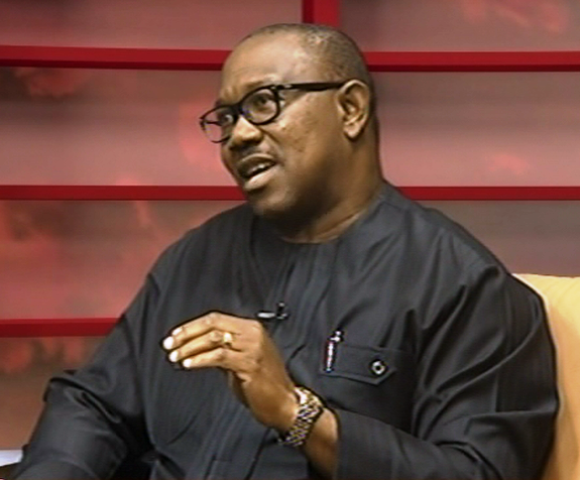 Peter Obi, vice-presidential candidate of the Peoples Democratic Party (PDP), says the only reason security operatives searched the private jet of Atiku Abubakar, is because he is the presidential candidate of an opposition party. On Sunday, a combined security team, including operatives of the Department of State Services (DSS), searched the jet that brought back Abubakar to Nigeria from Dubai. Commenting on this when he featured on a programme on Arise Television, Obi accused the current administration of harassing its opponents. “His only offence is that he is the presidential candidate of an opposition party. It is not as if you are not allowed to do a routine check,” Obi said. “I’ve been privileged to have travelled with a number of high-profile people in the past in a private jet where they gave me a lift. I’ve not experienced what was experienced. What I am saying is that we have a country and what we need now is to be showing each other love and show the example to the younger ones that we are not divided, that we are together, that we want the country to work. It’s about the country. Hadi Sirika, minister of state for aviation, had accused Abubakar of raising false alarm over his encounter with security operatives. He said searching of planes is a “routine process” which applies to all international arrivals “unless the passenger is the president of Nigeria”.